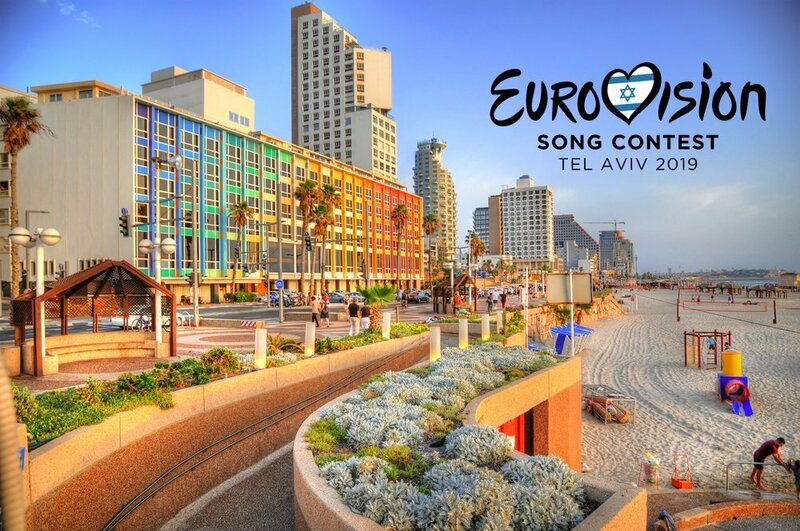 The Eurovision, the iconic European song contest, is taking place in Tel Aviv this year, from the 14th to the 18th of May 2019(two semi-finals on the 14th & 16th, the final on the 18th). This will be the 64th year for the Eurovision, so if you’re not from Europe, believe us when we say that this is a very big deal here on our continent. Tens of thousands of tourists are expected to arrive in Tel Aviv. Obviously not all of them will attend the actual event – tickets are sold out already. Most of them are looking to have an especially festive week in the city. The weather is perfect in May – warm and sunny, with clear blue skies. It’s probably the best month to visit Tel Aviv, just before the summer humidity descends on the city. So if you plan to be one of those tens of thousands – and by all means, you should, it’s going to be an incredible week – here’s a quick guide to the must-visit areas of the city. The Tel Aviv coastal strip is 14km long (8.5 miles) along the Mediterranean Sea, with a walking / biking promenade covering its entirety. It is called a ‘Tayelet’ in Hebrew. If you ask Israelis about the promenade, most of them will think you want pomegranate juice – you have to have some while in Tel Aviv, by the way. The beach is gorgeous. Fine, light sand, warm and calm water. What’s unique about it is that it’s literally in the city, within walking distance from almost anywhere. And thanks to the Mediterranean climate, May is definitely already a beach month when you’ll see plenty of sun-bathers and even actual bathers. The neighborhood of Neve Tzedek can be described as European-Mediterranean bohemian chic. Beautiful, romantic brick houses with colorful wooden shutters, small, curved alleys, lots of greenery and elegant restaurants and design shops. A little Tel Avivian village five minutes walk from the southern part of the Tel Aviv beach strip. When you want to take a breather from the urban center of Tel Aviv, a stroll and a glass of wine in Neve Tzedek will do the trick. If you manage to find a place to stay in Neve Tzedek – not an easy task as it is in high demand among tourists – you’ll enjoy a fairy tale-like stay in one of Tel Aviv’s most enchanting areas. Jaffa (‘Yafo’ in Hebrew) is at the southern tip of Tel Aviv coastline. It’s a bustling Muslim-Christian-Jewish neighborhood like no other in the city. It’s built upon an ancient port city, which dates back to biblical times. The Jaffa Port was left almost intact, with magnificent structures, pebble-stone roads and panoramic views of the coastline of modern-day Tel Aviv. Jaffa is like a window to the Middle-Eastern roots of Tel Aviv, and Israel as a whole. Different rhythm, different style, different way of life. It stands in stark contrast to the modern center of Tel Aviv, a microcosmos of people from all walks of life and religions that live together in harmony. Don’t miss the Jaffa Market – an eclectic mixture of antique shops, design shops and eateries both rustic and cool. Worry not, we’ve not left Tel Aviv for a different Israeli city. The White City is the beating heart of Tel Aviv, the urban center. The name comes from the thousands of Bauhaus buildings scattered through its streets and tree-lined boulevards. This is where you’ll spend most of your days – and nights! – when visiting Tel Aviv. This is the area that makes Tel Aviv what it is, a lively, urban green & white cosmopolitan of exciting and fresh culinary, kicking nightlife and good energies. Too many must-visit spots to list, so our best advice is just to walk it – side to side, back and forth, you won’t have a dull moment. So why should you come to Tel Aviv for Eurovision 2019? Tel Aviv is very different from classic Europe, mainly because it’s not in Europe, though about half of its inhabitants are of European descent. It’s also not really Middle-Estern even though it is smack in the middle of the region. In many ways that’s the real charm of the city – it is unlike any other. The Eurovision week is going to be a lot of fun in Tel Aviv. Even if you don’t plan to attend the event, it is a fantastic opportunity to join a massive international crowd in elevated spirits having an incredible time, enjoying an incredible weather and of course, celebrating the incredible city of Tel Aviv.